Whiteside Template Bits with Oversized Bearings are carbide tipped flush trim pattern or template router bits for your next DIY project. 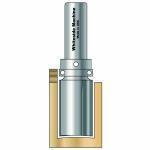 Whiteside Template Bits with Oversized Bearings are perfect for clean routed surface edges. Choose from the available shanks and diameters below to add a new Whiteside Template Bits with Oversized Bearings to your collection of woodworking tools today.